Indie line MCMC Fragrances has launched a new trio of perfumes for their Humanity Project. Monoi de Tiare, American Beauty and Crowned in Victory are exclusive to Anthropologie. For the third edition of The Humanity Project, we partnered with El Puente, a community organization in Brooklyn, NY by teaching a six week perfume course to a group of young women as part of the Youth Leadership Program. Three new fragrances are inspired by this experience. They are being sold exclusively through Anthropologie. A portion of the proceeds from this collection will benefit El Puente's work in the community. Monoi de Tiare ~ with coconut oil, sea spray, tiare flower and vanilla. American Beauty ~ with pink pepper, heritage roses, wild violet and leather. Crowned in Victory ~ with fig, poppy, ivy and everlasting flower. MCMC Fragrances Monoi de Tiare, American Beauty and Crowned in Victory are $48 each for 30 ml Eau de Parfum. Anthropologie’s one of my favorite places to browse. Haven’t had any luck with the scents there, but I like that they’re accessible (and I’m always on the lookout for something affordable and easy-to-find). I’ll like tiare and rose, so I’ll give the line a shot. Maybe they’ll be nice casual scents. I don’t think I’ve ever bought perfume there either…and I love browsing there too! The scents themselves seem rather meh, but those boxes and bottles! Cute! I’d like to try them — the brand generally does a good job. But you’re right that the descriptions could be more enticing! I’m amazed that the name “American Beauty” hadn’t been taken yet! Actually, Dawn Spencer Hurwitz released her ‘American Beauty’ a number of years ago. It is my all-time favorite, true-to-life rose fragrance. You get the heady, perfumed petals, the bright leaves, and the pulpy green stems in one gorgeous rush. When I saw this MCMC scent mentioned yesterday on another blog, its notes struck me as strange, as I can conjure only Dawn’s ‘American Beauty’ when I hear that name. 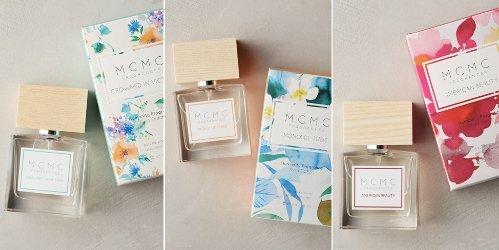 I do think these are worth sampling, as MCMC has some nice fragrances, the price point on these is pretty darn amazing, and the packaging is quite well done).